Foley Gallery is pleased to announce “Games of Consequence”, an exhibition of new photographs by Australian photographer Polixeni Papapetrou. 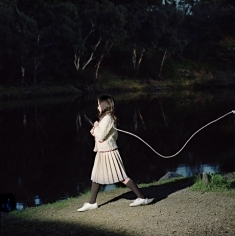 With the variant, looming contours of rural Australia to serve as scenery, photographer Polixeni Papapetrou sets her adolescent models into a potent series of reminiscent yet equivocal scenes of childhood play. Her prowess in and predilection for polished composition yields Papapetrou the crisp, cinematic stills of “Games of Consequence”. It is intently, the flawless articulation of these exacted elements: the leer of a black river, the pair of cardinal-red stockings, and coiled skipping rope in Papapetrou’s photographs that beguile us into enchanted memories of a near forgotten past. Papapetrou has precisely distilled each one of the series’ scenes to present her audience with high definition and integral elemental clarity. The natural stage, and child’s costume, posture and prop are composed scrupulously by the photographer. This strong, seamless visual presentation draws us instantly to each scene’s most consequential inflections; the child’s silent sidelong glance, her deep, steady preoccupation, and cutting glare all impose some threat upon our pure and idyllic statues of youth. As Papapetrou’s photographs so acutely render, it is only their eye’s gaze that opens unto the “…wonderfully heterogeneous dimensions of childhood, where the fear and danger mix with the angelic." 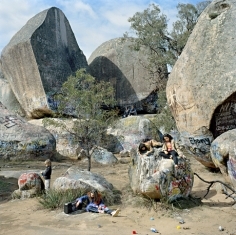 Set in the vastness and crevasse of Australian rock, plane, ocean and bush, “…the landscape is portrayed as a metaphorical shelter, an arcane place where children can make discoveries about themselves and where their imagination can flourish.” And indeed, Papapetrou invites us to view far corners of imagination, suspending chords of fantasy in each image. She invites us into the enigma of young dreams, and to evoke the depths of childhood, mind, body and spirit. 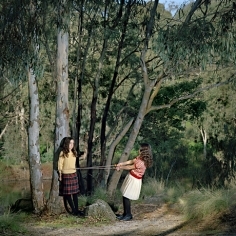 This is the second solo exhibition of Polixeni Papapetrou’s photography at Foley Gallery. She has exhibited widely throughout her home continent, as well as internationally. Her work is included in a number of prestigious public and private collections, including the Sydney Museum of Contemporary Art, the National Gallery of Victoria and the National Gallery of Australia. In 2007, Polixeni received the New Work Grant from the Australia Council, Visual Arts Board, and the International Touring Grant from Arts Victoria. Polixeni currently resides and continues to photograph in Melbourne, Australia. The exhibition will remain on view until October 11, 2008. Foley Gallery is open Tuesday – Saturday 11AM – 6PM. For more information or to request images, please contact the gallery at 212.244.9081 or via email at info@foleygallery.com. Gallery Hours:Tues – Sat, 11AM – 6PM.